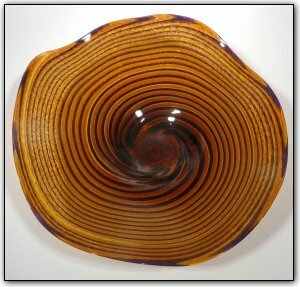 This gold topaz wallbowl features a mesmerizing swirl of dark purple fading into black as you look towards the center. The pattern was made with canes of bright colored glass, which is a two-stage time consuming process. First Dirwood hand pulled the canes used to make this bowl, then he made the bowl using those canes.